It seems 2016 is flying by in the blink of an eye. And while I haven't been writing many decor posts, that doesn't mean I haven't been working on some exciting decor projects. While 2016 may have started out on a bit of a low, there have been a lot of things I've really enjoyed doing. Today I want to fill you in on both my rough start to the year, and also one very fun project. This past January I kicked off the year with planned surgery on my left hip. It makes me feel decidedly old to announce (and live through) this, but I actually had the same surgery on my right hip in January 2015, so I knew what to expect. More specifically, I had the understanding I'd need to be almost completely off my feet for a full month. 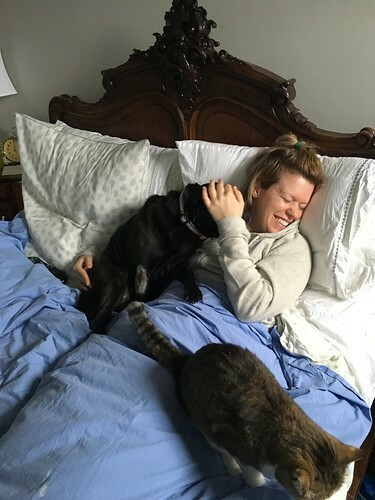 If you've ever been essentially bed bound and recovering for an extended period of time, you understand that it is a challenging time having to rely on the help of your significant other, family, or friends. I felt like a burden and was frustrated by how much I had to rely on the kindness of everyone to do routine things. I did keep myself busy binge watching Gilmore Girls (every season, every episode, every.single.one, Go Team Luke! ), eating all of the delicious things that so many wonderful people brought as gifts, planning the projects I wanted to tackle once I could walk again, and making my way through several coloring books. Luckily, I had a steady stream of visitors and almost constant companionship from my dependable feline and canine compatriots, which also kept me entertained. 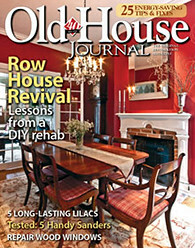 In addition to the activities I already mentioned, I was also working on a project with HGTV Magazine! Back in December, while I was completely dreading the downtime I knew I'd have in January, I received an email from HGTV Magazine about a project they had in mind. They wanted to work with me to create a room design for the winner of a promotional sweepstakes they launched with Diet Coke. 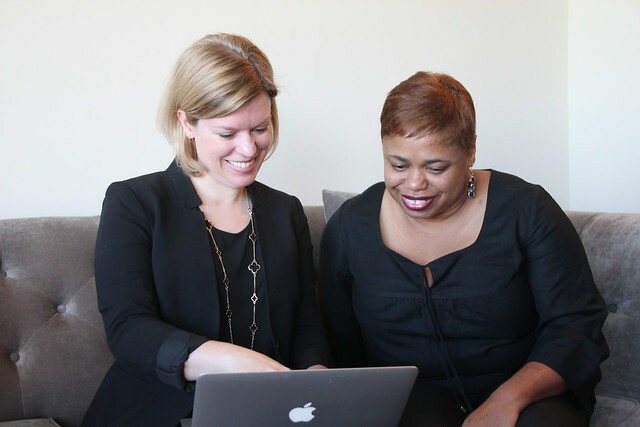 The people at HGTV Magazine know of our blog and my keen interest when it comes to interior decor, and they invited me to work with their sweepstakes winner, who lives in Arlington, Virginia, to create the room makeover plan. Knowing what I'd be facing with my recovery in January, I was so completely excited to have something fun and engaging to look forward to. Now I'd like to share my thought process on how I pulled together the makeover plan, and the approach I used to create a shopping list for this unique project. A little while after surgery I kicked things off when I started emailing with the winner, Bridgette. Bridgette had won a $500 gift card and room makeover, and we were going to come up with a plan to put that gift card toward making over the living room of her condo. 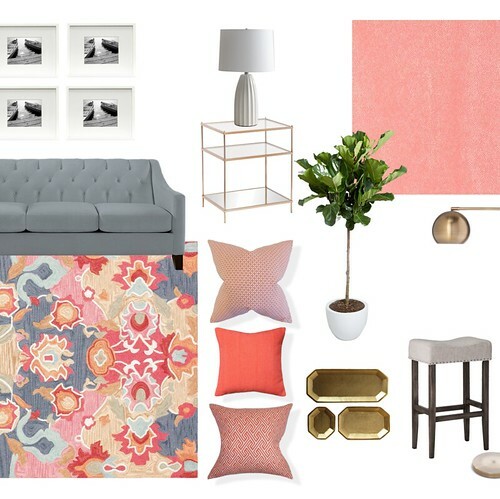 It was up to me to talk to her about her aesthetic preferences and formulate a mood board, source list, and a few options to turn her living room into a place she would be able to entertain and relax. Bridgette is a self proclaimed decorating novice, and she was extremely open and receptive new ideas and approaches with her home. Since she is renting her place she wanted to make all of her statements with the colors of her furnishing and accessories, while leaving the walls the neutral paint color that she inherited. After our initial conversation, I learned that she had a fondness for bright colors and vibrant, uncluttered spaces. 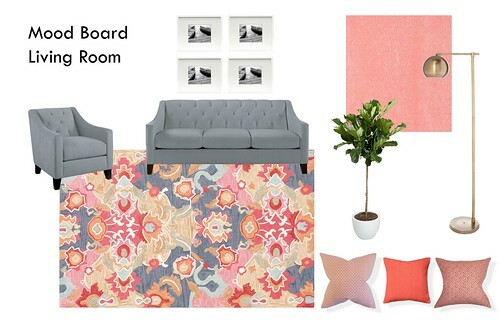 And while $500 is not a huge budget for a complete room makeover, she already owned a grey sofa and coordinating chair and storage ottoman that we would use as the base of her room design. With a good understanding of what she was looking to achieve, I started sourcing well priced furniture and accessories to pull together a pleasing and functional room design. 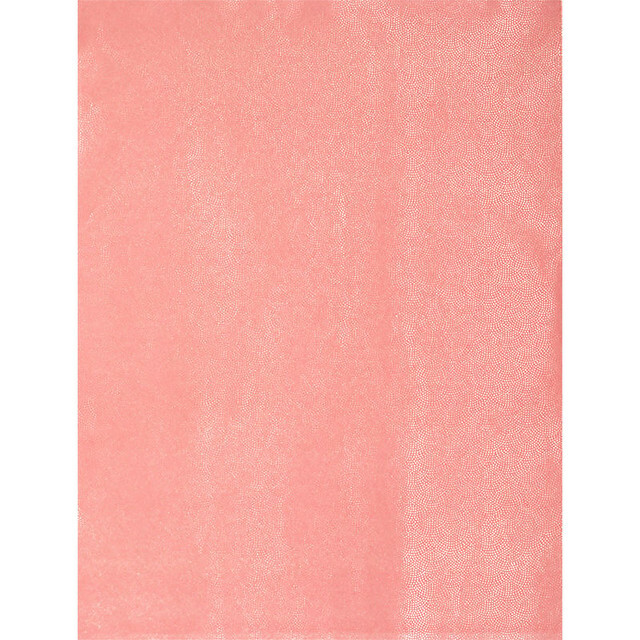 Given Bridgette's tastes and what we were trying to achieve, I absolutely love the rug I found on Overstock. 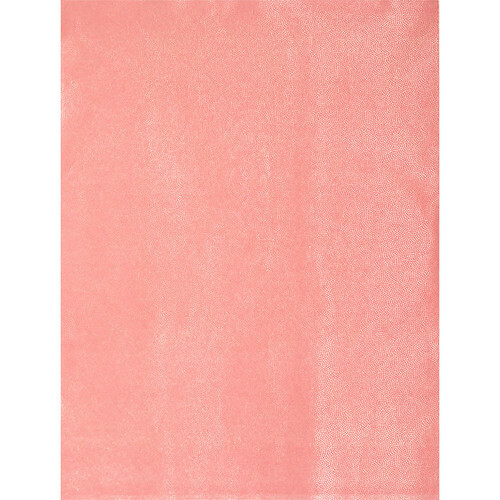 She had let me know that two of her favorite colors are coral and tangerine, and this rug also has a bit of gray in it to tie it into her existing furniture. 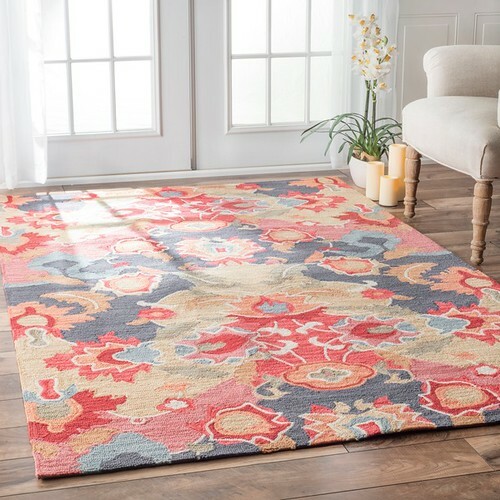 Against the gray sofa and chair, neutral walls, and dark wood floor, this rug would work as the major statement for the room and act as a way to bring in a lot of color without painting the walls or changing out the furniture. 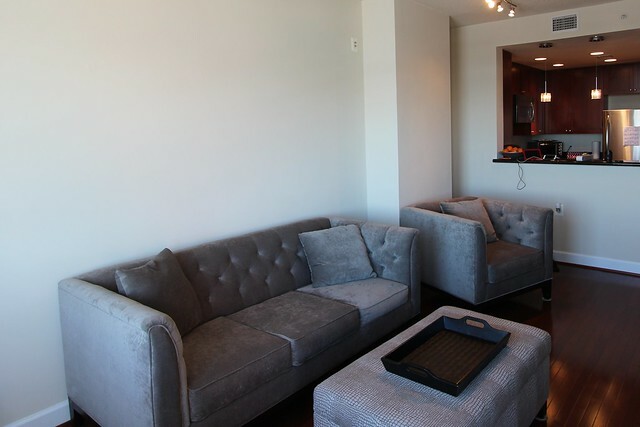 It would also anchor the furniture and create a defined living space in her open condo. The rug tied in so well with her gray furniture while also opening up a large palette of options for the accessories and wall hangings we could work in around the room. 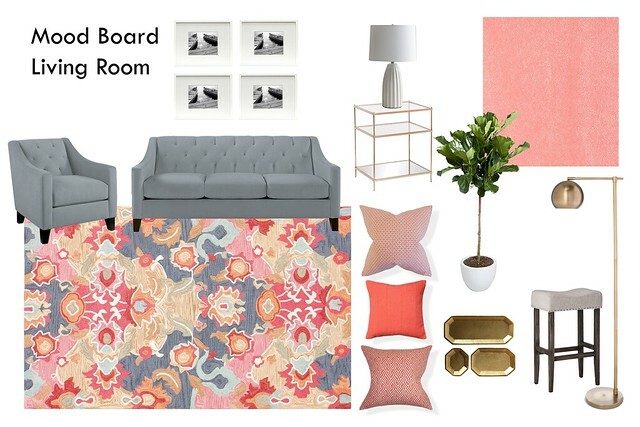 Since the goal of this project was to provide a mood board and shopping list within the $500 budget, I had to try my best to source things from websites where we knew there'd be stock. This did make it a bit more difficult, since a trip to HomeGoods could or could not turn up just what we were looking for. But my plan was to also make sure Bridgette understood that the mood board I was going to give here could be used as either a shopping list or as inspiration in case she found the right thing at another store. Okay, back to the room. Once I had the room (my mood board) anchored by this large vibrant rug, I could turn my attention to finding accent furniture that would work to complement the colors of the rug. 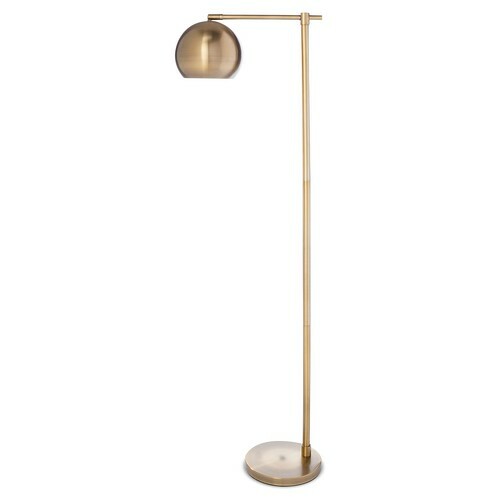 After a long search I found a mid-century inspired brushed gold floor lamp from Target. The floor lamp could sit between the sofa and chair and provide ample light to the area. To fill some of the large open space above Bridgette's couch, I proposed a collection of four large gallery frames. Within these frames I suggested framing a piece of this beautiful coral and gold swirl paper to bring color and interest onto the neutral colored wall. I really like the idea of using a fancy paper in frames when you don't have prints or other art work that can go in the room. 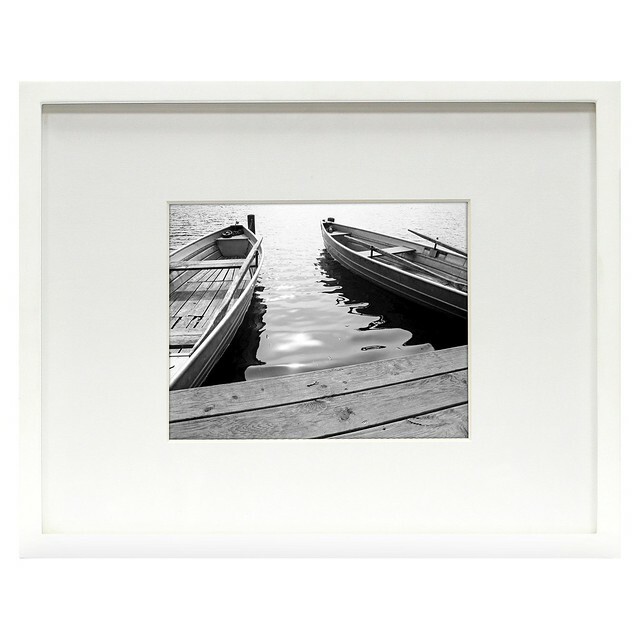 It's a wonderful low cost alternative to framed art, adds visual interest to the wall, can be easily changed out in the future, and isn't one of the run of the mill things you normally see on the wall. Since the couch below the frames is large and gray (and very neutral in the space), I wanted to add some color by way of a few throw pillows. This would allow us to bring in the color elements she loves while still maintaining the traditional and neutral look of the gray. I chose the three pillow above, two for the couch and one for the chair, to tie in quite nicely with the rug. I particularly like the design patterns and texture, and feel they work quite nicely with the lap I suggested earlier. Like the frames paper, the pillows are a wonderful way we can liven up the room with color in a low cost and easily changed manner. To add a little bit of softness to the room, I proposed that we should add some greenery by way of a fiddle leaf fig plant. 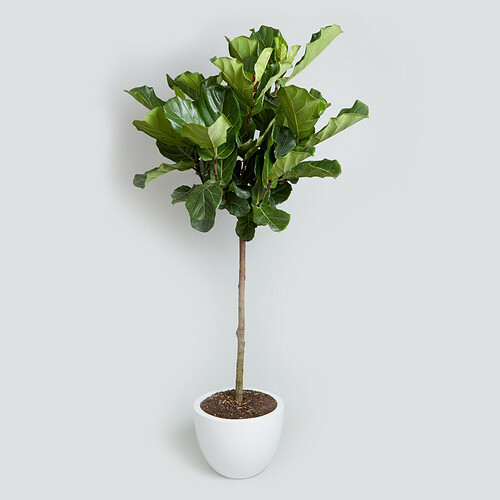 This medium sized plant will be able to provide just enough life to the room to make it feel much fresher, especially during the colder winter months when so much green is gone from outside. This brings us to my mood board in progress for what I was thinking of as Phase I. Phase I, in my mind, is what Bridgette can purchase using the $500 prize. But, I also wanted to include a few extra options, a Phase II, should she wish to do a little shopping on her own. The main thing I wanted to do in Phase II was to add a few additional accessories, seating, and lighting. I started by proposing a gold mirrored side table that could sit next to the couch. This table would provide a great base to place a white ceramic lamp which will provide some additional layered lighting for the room. 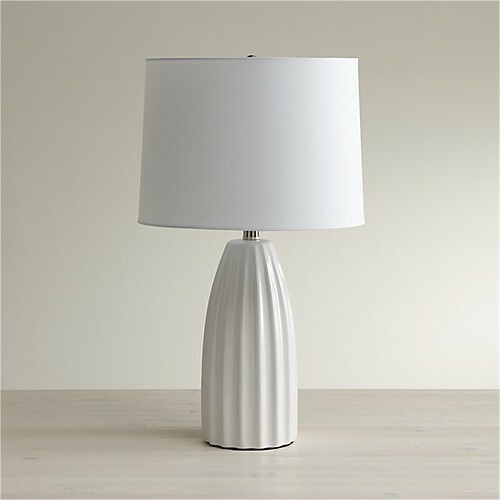 Adding this table lamp along with the floor I suggested for Phase I should provide the type of layered light that makes a room feel much warmer. When you only have overhead lighting I feel a room tends to gravitate toward being too sterile. Bridgette told me that her apartment also has an open kitchen to her living room, including a peninsula bar area between the two. This would be a perfect space for a little bit of additional seating by way of bar stools. 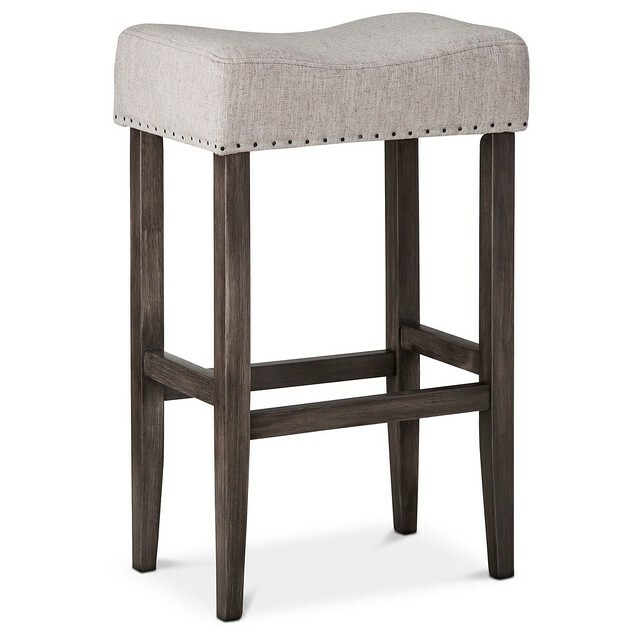 These stools would allow guests to sit and chat while a meal is being prepared, and could also easily be used as extra seating during a party. The main thing I wanted to do here was add a little versatility without taking up a lot of space. 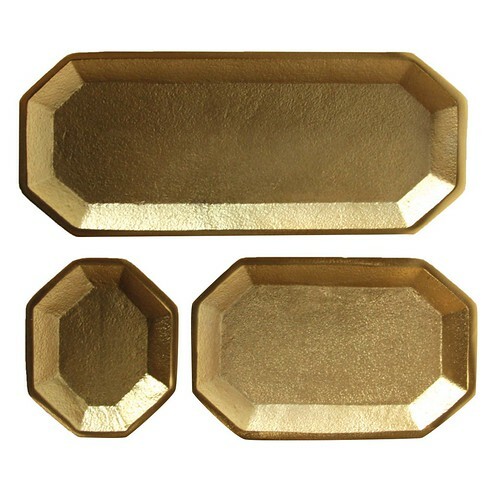 Finally, I wanted to add a little bit more gold to the room by way of some geometric metal trays. These trays will work either on the ottoman coffee table or even arranged hanging on the wall. 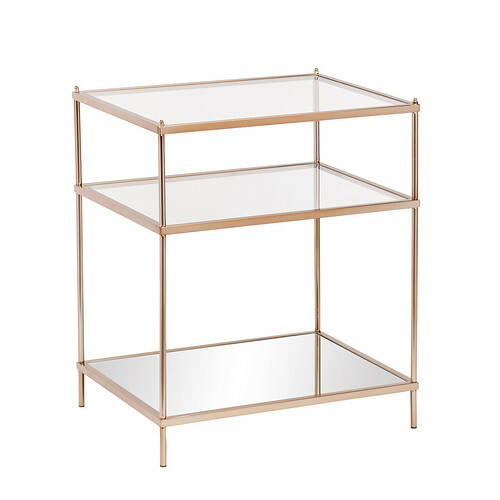 Something like this is often necessary when you have a soft coffee table and want something more substantial so you can place food or drinks without feeling like you need to cover the whole coffee table with a tray. The final Phase II mood board with additional accents really pulled everything together. Feeling good about my efforts creating the mood boards, and after I'd adequately healed enough to feel comfortable venturing out into the snow on my crutches, we arranged an in person meeting with Bridgette so I'd be able to visit her home and present the plan for her room. When I first walked into her condo I was struck by the large window view of the Potomac river. Her living room is situated just in front of this window, and I knew right away that the mood board items would work perfectly for her to turn her space into something comfortable and inviting. In addition to her couch and chair, she also had an white fireplace and mantle complete with gold bulldog figurines, a nod to her alma mater. After going over the plan with her, she and Alex moved some of her furniture a little bit to get a better flow in the room, while I was forced to sit on the couch and watch. I did muster some ability to balance myself on one leg while helping to show her how I'd hang a few of her existing pieces of art on her entry wall. We spent a few hours with her going over everything, getting to know more about her, and talking about how she could better utilize the space. By the end of my visit with Bridgette, she was energized and very happy with the plan, and very much looking forward to seeing our vision become a reality. Unfortunately, I don't have any after photos for you as implementation of the plan is up to Bridgette when she has the time and desire to see it through, but I've included links to the mood board items above if you're interested in price or details. It's my hope that what I've shared regarding my thought process and how I went about tackling this project will help you if you're looking to redecorate a room. It's nice to see that with a few existing pieces, you can make a substantial impact with only a few choice purchases. We're so very happy that Bridgette won the HGTV Magazine/Diet Coke room makeover giveaway. It gave us a wonderful opportunity to meet and help a local resident transform her space, and it provided me a welcome chance to provide some interior decor advice while I healed. Love this post (especially the links)! 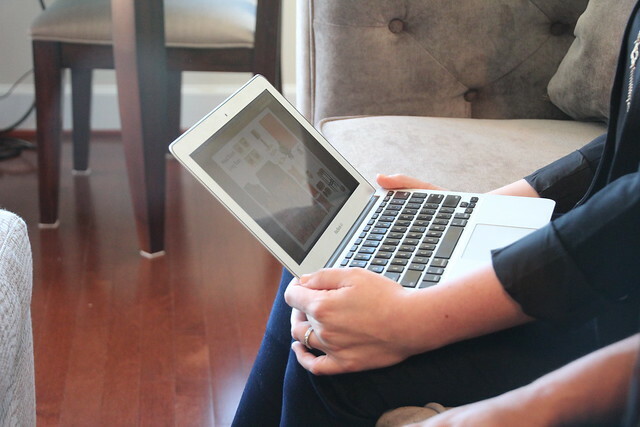 Thanks for sharing your great ideas and Bridgette's living room make-over. Loving the rug!! Great colours. Spot on with the mood board. Thanks for letting us in on the process--very helpful. Hope we get after photos sometime, pleeease Bridgette. Sorry to hear about the hip surgery. I'm having a tear in the labrum in my right hip repaired in late June and I'm not looking forward to the recovery time afterward. Surgery on the hip sounds rough. Hope it helped you reach 100% health. I really like the mood board. I especially like the rug. I have such a hard time choosing rugs. Because of their cost, I tend to view them as mostly-permanent. Therefore, I get myself worked up about choosing just the right one. It is silly. What a lucky winner! I hope she has pictures later; it sounds like a very cute apartment. $500 and you have such a fantastic makeover, good job.